Does your child love fantasy? Is he an adventurous little soul, who loves dreaming about pirates? Are you looking for some ways to take him on a swashbuckling sea adventure? 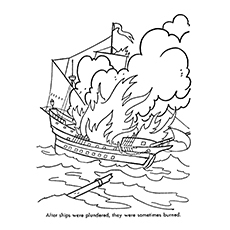 Then, why don’t you try our pirate coloring pages? These amazing coloring pages will fuel his passion, and hone his drawing skills. Pirates evoke stories full of adventure and heroism for children. Once the bane of the harbor towns and high seas, the activities of pirates thrill children of all ages. Pirates have gained immense popularity over the years, primarily because of pirate movies. 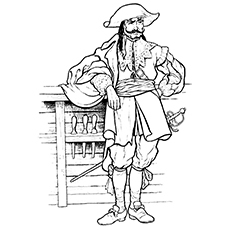 So, here are 25 finely detailed coloring pages of pirates who are famous of all time. We have illustrations depicting the daring deeds of pirates. We also included some popular pirates from TV, and the movies, and some popular cartoon characters dressed as pirates. Jake is ready for an adventure, but he needs some color before he ventures out. Can your child do the honors? “Jake and the Neverland Pirates” is an animated show based on Peter Pan. The series centers on a group of young pirates – Izzy, Jack, Cubby and their Pirates Bucky and Skully. These little pirates live on the pirate ship and spend most of their time competing with Captain Hook for the treasure. Jake is the protagonist of the series. He serves under the wing of Peter Pan. His job is to protect Neverland after Peter Pan left the island to explore the world. Jake possesses a wooden sword that provides him with unique powers. Jake is a natural leader. He is caring, daring and fearless. How did the Pirates travel across the oceans? They traveled by their pirate ship. The pirate ship didn’t just help them move; it was a moving battering ram, which pirates used to conduct raids. The most desirable pirate ships were those that were swift, well equipped and nimble enough to dodge counterattacks. The pirates usually stole the ship and customized it with their hands. They removed the upper structures, forecastles and cabins to make the ship speedy. They removed the interior bulkhead to add more crew space. They would even change the sail arrangement and mast and would add more gun ports. Most of the captured ships were set on fire during the fight and burnt until they sank. 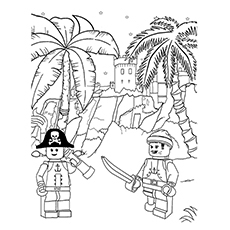 Here is a pirate coloring page of two mighty Lego Pirates. With a few colors and some imagination, you and your little one can change these Lego pirates coloring pages into a masterpiece. Lego launched the Pirates theme in 1989. It features pirates, islander, soldiers and sailing ships. They also included blue-coated troops to fight the pirates. The French navy and marines of the Colonial era inspired these forces. 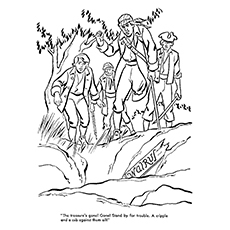 The coloring page features two Captain Roger confronting the Governor’s soldier. Captain Roger is the chief antagonist and the leader of the pirates. He suffered several major injuries, and he has to wear an eyepatch over his left eye, a wooden right leg and an iron hook on his left hand as a result. The pirates continuously fight against Governor Broadsides’ troops. 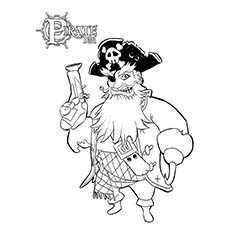 The coloring page features the most fearsome and notorious pirate of all time, Blackbeard. Blackbeard or Edward Thatch was a shrewd and calculative pirate. He began his career as a privateer but carved his niche on the water in the exact pirate-style. He called his ship, Queen Anne’s Revenge. He would use his fearsome image to scare people who would dare steal from him. He would light fuses under his hat to frighten his enemies. Blackbeard spent most of his life sailing up and down the coasts of the Caribbean and America. Have your child break out his black and red crayons to bring this fearful pirate to life. Set sail with this pirate map coloring page. The treasure chest is a wooden box where pirates store their loot. The buried treasures play a significant role in the legends surrounding the Old West outlaws and pirates. Legends say the criminals and thieves often buried their stolen treasure in remote places, intending to return later. 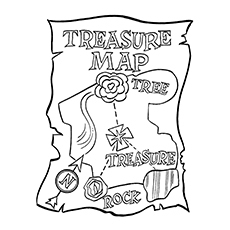 They would use the treasure maps to locate their treasure. But studies say that pirates rarely buried their treasure. The only pirate who buried treasure was William Kidd in the Long Island. People also say that one or more pirate captains stashed large amounts of treasure on the Oak Island in Nova Scotia. But no treasure has been unearthed yet. Boochbeard is one of the legendary pirates. He did everything, but couldn’t succeed. Nobody knows where he belonged or what he did before becoming a pirate. It seems that Boochbeard has been a pirate since birth as almost all the Buccaneers and Privateers of his time has seen him. Boochbeard was always just a dominant scheme away from all the riches that he had dreamt of. The exploits of Boochbeard are popular in every corner of the Spiral. People call him by different names. Some call him Old Whitebeard while some call him the Marleybonian Navy. To some, Boochbeard is the luckiest, yet unluckiest Pirate of all time. 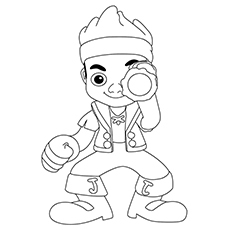 Your little buccaneer will have a great time adding color to this ancient pirate picture. 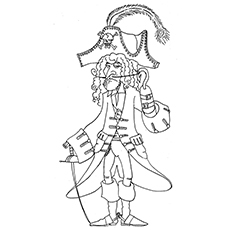 Here is another pirate pictures to color of an English Pirate. During late 1600, France, Holland and England were continually involved in wars with each other. It made the distinction between the pirate and the privateers very thin. Captain English received letters of the marque from his government to attacking the enemy during the war. When the peace returned to the region, they reverted to piracy, attacking a ship or vessel that they came across. 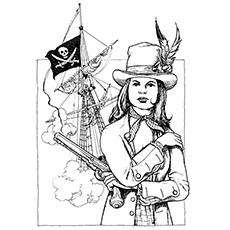 This pirate coloring page will entice your child’s imagination. Francis Drake was the first Englishman, who traveled around the world as both pirate and privateer. Look at this fearsome Bartholomew Roberts, one of the most famous pirate Captains. Roberts was the last great pirate of the Golden Age of Pirates and one of the most successful too. His activity center was Africa, Atlantic, and The Caribbean. He plundered more than 400 ships, which is a record amongst the pirates. The main reason for Robert’s success was his fearlessness and boldness. Bartholomew Roberts sold or burned most of the ships, the only exceptions being two warships- Royal Fortune, the one with 26 and 52 cannons and the Onslow, the prize ship of Royal African Company. He died in the battle against Captain Challoner Ogle of the British Government. These two cats are too cute to call pirates. Where are these two cat pirates going? Are they going to rob a ship? We think that they are going to attend a Halloween party. Tell your child to make his story around this wild picture. And don’t forget to make him color the image. 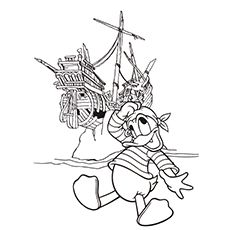 Here is a pirate coloring sheet of Donald Duck decked up as a pirate. It seems that he has successfully retrieved the treasure box. But where is the treasure box? We think that someone has made off with it. Can your child give it back to him by drawing a treasure chest with some jewels and gold coins? Nobody would want to disappoint Donald for sure. The scene is from the comic “Donald Duck Finds Pirate Gold”. In the comic, the four nephews of Donald Duck, Huey, Dewey, and Louie encounter Yellow Beak, a pirate who leads to a lost treasure of Henry Morgan. But Black Pete, the antagonist, wants the treasure too. What follows is a series of adventure, hide, and seek games between Huey, Dewey and Louie and Black Pete. You can ask your child to write an amusing Halloween story to go along with this character. Ahoy, our pirate mates! Here is a simple activity for you. Print out this pirate color page on card stock paper and then hand it to your children to fill some exciting colors in it. After they have decorated the sheet, tell them to cut along the dotted lines. If your child is very young, then cut it out for them. Stick the cutouts to the Popsicle sticks using tape or glue and your awesome pirate puppets are ready. Use these pirate puppets to scour the ocean for the treasure with your child. 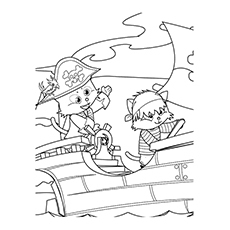 Go on board for adventure with this pirate flag coloring page. 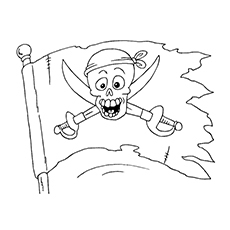 Ask your kid to color this pirate flag and tell him imagine all the exciting sea voyages that its owner is about to indulge in. Each of the famous pirates had his distinctive flag or jack. The flags helped identify them to their friends and foes. The pirate flag also referred to as “Jolly Roger” was an Anglicization of the French ‘Jolie Rouge’. This coloring page features one of the most recognized or common pirate flags- the black flag. The Black Flag has the skull and sword design. It is one of the most recognized symbols of piracy. 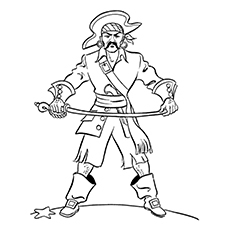 The flag featured in this coloring diagram is of John ‘Calico Jack’ Rackham. 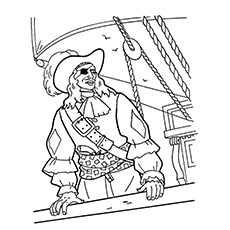 Get aboard for a colorful voyage with this pirate coloring pictures. The treasure map marks the location of the lost mine, a hidden locale, a valuable secret or the buried treasure. Francis Drake was the first pirate who buried the Spanish silver and gold after raiding training in Nombre de Dios. Drake got hold of the map, retrieved the loot and sailed for England. Hundreds of treasure maps are still laying that could make you rich, provided you find the clues. 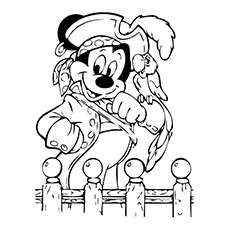 The coloring page features the infamous pirate Captain Hook from the Peter Pan franchise. Hook is the saltiest and surliest captain the Neverland. His friend Smee often accompanies him in all his pursuits. But Peter Pan, Tinkerbell, and the Lost Boys interrupt his adventures. Captain Hook also abandoned the sailing to take revenge on Peter Pan for ruining his life. Peter cut off the left hand of Hook and fed it to the crocodile. Captain Hook is the cunning and menacing villain, yet Peter makes a fool of him quite often. Despite this, Hook is a violent character. He does not hesitate to kill people to fulfill his motives. Hook is also manipulative and intelligent. He even tricks Peter Pan into believing that he surrendered to him. What kid does not want to be like Mickey Mouse? You can get to play and have fun all day long. He even has his trusted Pluto and Donald to help him out whenever needed. The scene is from the episode “Mickey’s Pirate Adventure”. In the episode, Mickey and his clubhouse friends sail for swashbuckling voyages on the pirate. They go treasure hunting to help their outer space friends solve some puzzles. Mickey acts as the captain of their fleet. This iconic character has places go, but you must first add colors the scene. If your child is good at drawing, then you may ask him to draw Mickey’s friends on the coloring page. 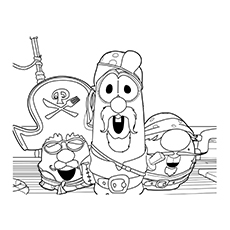 The funny characters you see in the coloring sheet are from the series “Veggie Tales” and the scene is from the movie “The Pirates Who Don’t Do Anything”. The Pirates Who Don’t Do Anything is an animated film featuring the characters of the “Veggie Tales”. In the movie, three lazy misfits, Larry, Pa Grape, and Mr. Luct embark on a pirate adventure with their silly songs and trademark humor. They find themselves traveling back in time to fight the tyranny. Together, they help a princess rescue her brother from the pirate villain, fight the giant rock monster, the evil Cheese Curls and of course, their fears. They are the most unlikely heroes that anyone could even encounter. 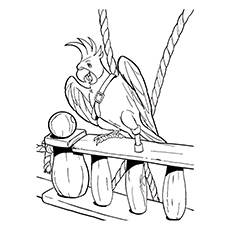 Here is a pirates coloring sheet of a Macaw. The colorful and talkative bird always features on a pirate’s shoulder. But do you know why pirates would keep parrots as a pet? Historians say that the pirates or seafarers would often bring home the exotic faunas like macaws as souvenirs. They attracted the pirates because of their colorful feathers. Besides, these macaws can quickly learn to speak and mimic. They were also easier to take care for than monkeys or any other animal for that matter. Besides, macaws do not eat much and are not very big, so even if there were not much food on the board, the crew wouldn’t think of eating them. And even the macaws like people, so they won’t attack the crew. 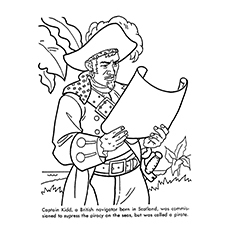 Here is a coloring page Captain Kidd reading a treasure map. William kid was a Scottish sailor remembered for his trial and execution for piracy after returning from his voyage to the Indian Ocean. He was originally a British navigator, born in Scotland. The military appointed him to suppress the piracy of the seas. But his behavior strayed into piracy. William Kidd hoped that his treasure could help him bargain negotiations to avoid his punishment. But his plan was unsuccessful. This coloring page brings reading as well as History to your kid. As your child adds color to this scene, tell him everything about Captain Kidd. 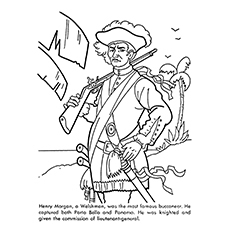 Here’s a pirate color sheet of Henry Morgan, one of the most famous buccaneer. Henry made a name for himself with his activities in the Caribbean. He was the worst enemy of Spain since Francis Drake. He raided Spanish settlements, attacked prominent targets and captured both Panama and Porto Bello. Henry earned the reputation of one of the most successful and notorious privateers in the history. Privateers were legal pirates. They were mercenaries who attacked enemy ports and ships. Henry kept most of the loot and shared some with the crown or government in some cases. Henry was famous on both sides of the Atlantic and was a legend when he died. 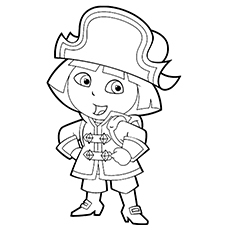 Ask your kid to color the adorable Dora dressed as a female pirate captain. The scene is from the episode “Dora’s Pirate Adventure”. In the episode, Dora and her friends set up a pirate musical play, but even before the commencement of the play, the Pirate Piggies steal their treasure chest costume, thinking it has gold. Dora’s gang tries to stop the pirates, but they were long gone. Dora and her friends, then head to the Treasure Islands to teach the pirate a lesson of their life. This coloring page is hard to resist. 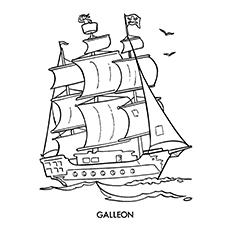 Here a coloring diagram of Galleon, a large, multi-decked ship used by the European states from the 16th to the 18th century. The Venetians had built this ship in the 16th century against the Pirates. And by the second half of the 16th century, various galleons were sailing along the Mediterranean. Was the galleon effective against the pirates? Well, it wasn’t. There was no stopping the pirates during those days. And anyone who tried, met his or her doom. And a Spanish Galleon laden with gold made a grand prize for the pirate. Let your child have a wild time filling color to this majestic ship. Do you want to teach your child alphabets in a fun and unique way? Then this coloring page will surely appeal to him. 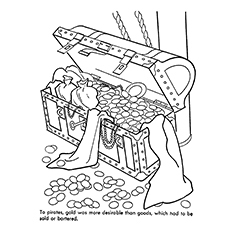 The coloring page features the upper case and lower case P along with the diagram of a little pirate and his treasure chest. 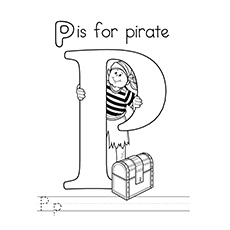 The coloring page also asks children trace the letter P. Don’t even try to steal gold from his treasure chest. It will make his furious. But, how did this little guy even become a pirate? 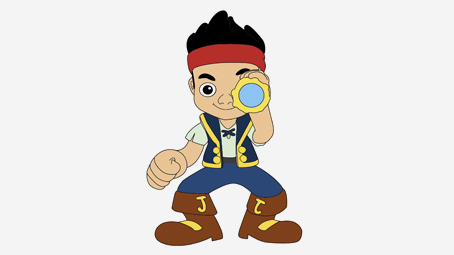 Narrate your child a story on how this adorable pirate reached the ship and what he is planning to do. We hope he doesn’t encounter the mysterious sea dragon in the waters. Do not forget to add some fun colors to this little pirate’s costume. Mary Read was the English pirate who sailed with Anne Bonny ad Calico Rackham. She was renowned for her endeavors from 1718 to 1720. The British authorities captured her soon after, but she was let off because of her pregnancy. Mary Read was born to the widow of a sea captain. Mary enjoyed dressing up as boys since her childhood. When she was going to West Indies, the pirates attacked and captured her ship. She joined the pirates and lived with them before accepting the King’s pardon in 1720. Mary was an excellent fighter, which probably got her a prominent place in her group. Looks like the sailors and pirates are preparing for an epic battle on the high seas. Look at that one legged pirate. It seems that he is the captain, and he is up to something. What could it be? Who do you think will win? Ask your child the question and see what he answers. Help him color the sheet. 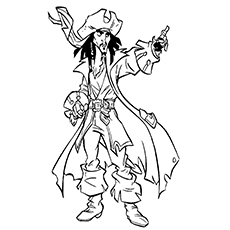 Here’s a funky coloring sheet of Jack Sparrow, one of the iconic pirates of all time. Jack Sparrow was the pirate of the Seven Seas. He had a dubious morality and sobriety and fought a constant battle with his best tendencies. Unlike most pirates, Jack did not have many worldly possessions, and whatever he had, the other pirates or looters of the island stole it. In the film “Pirates of Caribbean”, Johnny Depp plays the role of Jack Sparrow. Coloring is crucial for the overall development of your child. It will improve his motor skills, spark creativity and increase his concentration. 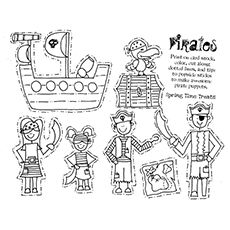 Our free pirate coloring pages are ideal for children who are looking for a creative activity to do in their spare time. These free, printable activities are also great if you are holding a pirate themed birthday party. Tell us which one your child liked the most. Leave a comment below.